I can’t believe it’s already Thursday and I only have 3 more days here in Indonesia. This 2 weeks is flying by! Our hotel has a breakfast buffet with a mix of Western breakfast foods like toast and traditional Asian foods like fried noodles and fried rice. 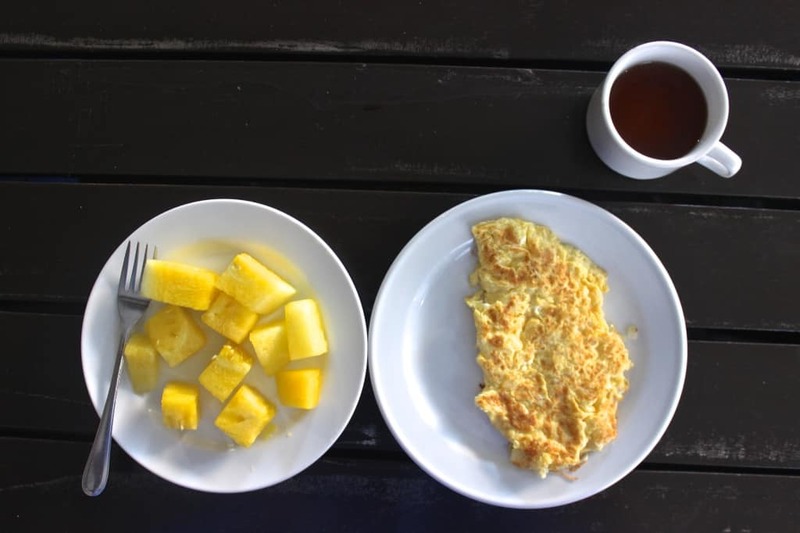 Since we eat Indonesian food for most lunches and dinners, I usually stick with familiar foods for breakfast and have been hitting up the omelette bar every day. Most of my breakfasts have been an omelette with fruit (like this yellow watermelon) & plain black tea to drink. On to less familiar foods! We’ve been eating out for lunch and dinner every day and we almost always go to the mall since malls are everywhere. 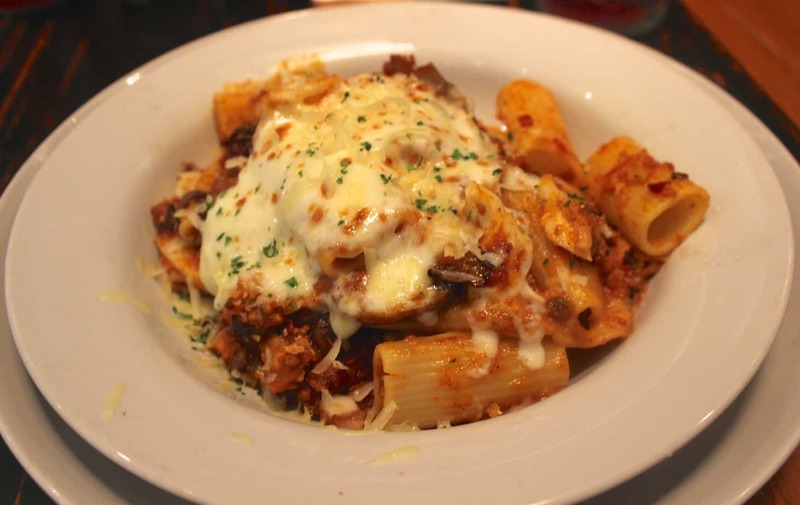 We also almost always order family-style, so we get a bunch of dishes for the table to share. 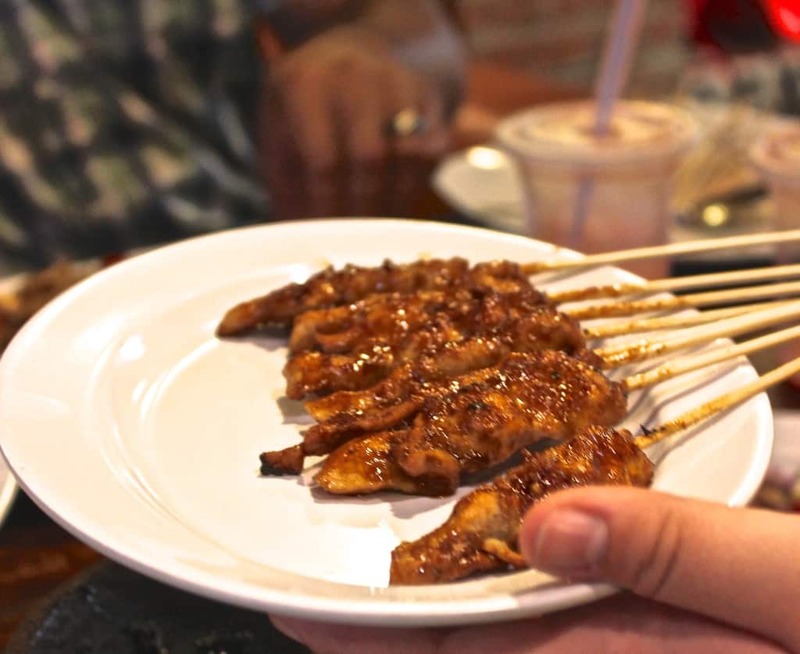 One of my favorite Indonesian dishes has been chicken satay, which is basically chicken kebabs with peanut sauce. 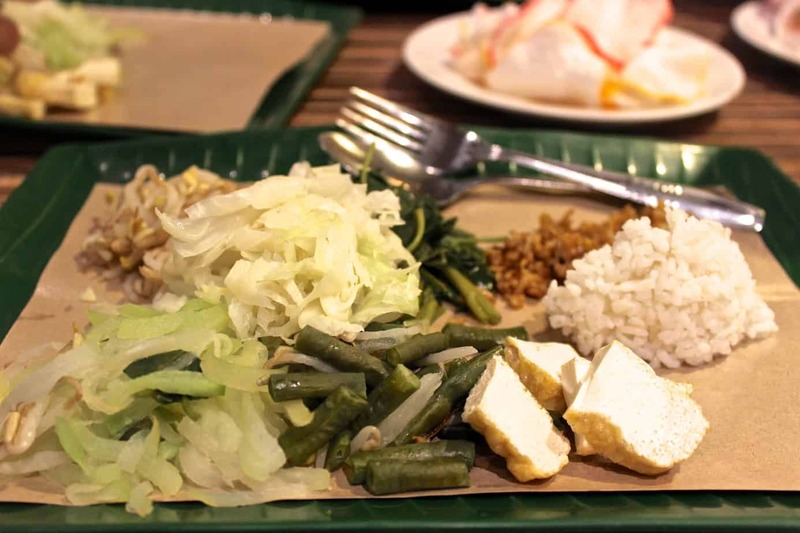 It was served with gado-gado, which is mixed veggies (green beans, cabbage, some kind of Indonesian wilted greens, bean sprouts, & tempeh,), also covered with peanut sauce that I ordered on the side. 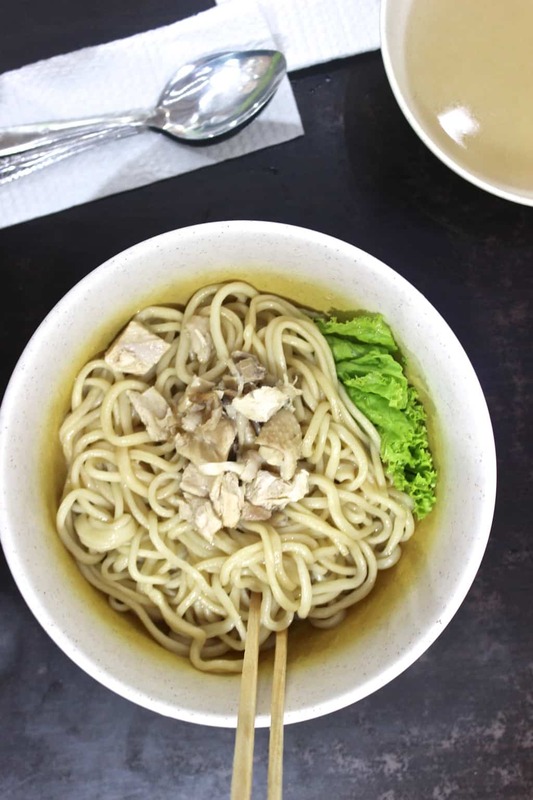 I love pasta, so I’ve also enjoyed some of the noodles I’ve had here, like this simple chicken and noodle soup. 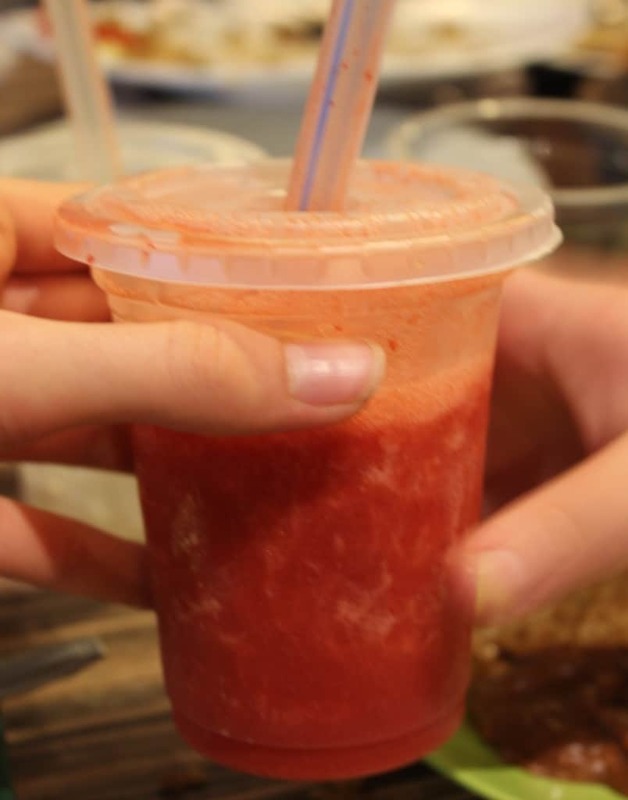 A popular thing to order at restaurants here is fruit “juice,” which is actually like a fruit smoothie because they blend frozen fruit and sugar together to make it. I’ve tried both strawberry and pineapple juices when an Indonesian-speaking friend asked for no sugar to be added and they were still great and really refreshing. 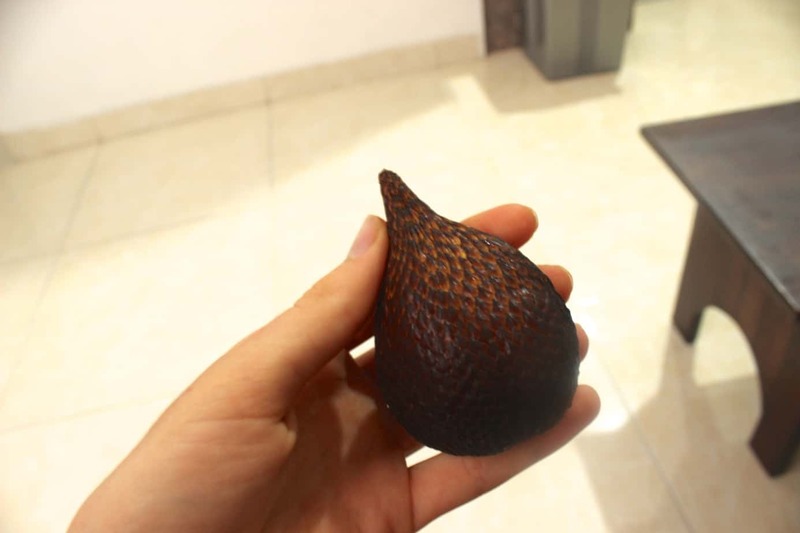 Another new fruit experience was trying snake fruit, which has a scaly snakelike peel. It was interesting…the taste and texture were like nothing I’ve tried before, but I don’t think I’ll be too sad that I can’t find it in the U.S. 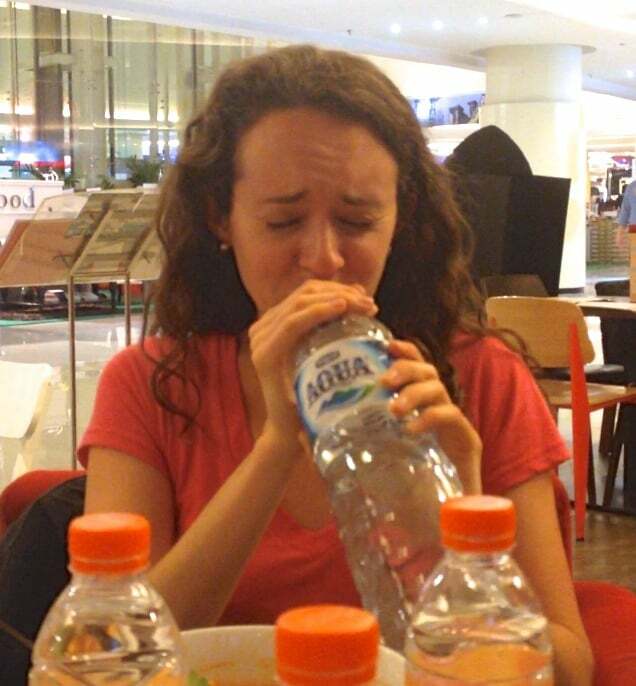 I also tried coconut water for the first time. We were visiting an area in the countryside and when we saw a coconut tree, one of the locals who was 15 or 16 scampered up the tree, whacked the coconuts with his machete, and knocked 3 of them down. He whittled them open and we drank right from the shells. It was kind of awesome. I also had a not-so-awesome food experience at lunch one day when I ordered some kind of hot and sour soup with chicken and veggies. See those small green veggies on the right side of the bowl? They’re green chili peppers that are used to flavor the soup and apparently, you’re not supposed to eat them because they’re really spicy. I didn’t get the memo, and popped one into my mouth with my chopsticks, assuming it was a green bean. I quickly realized my mistake when my mouth felt like it was on fire about 5 seconds later, but it was too late. 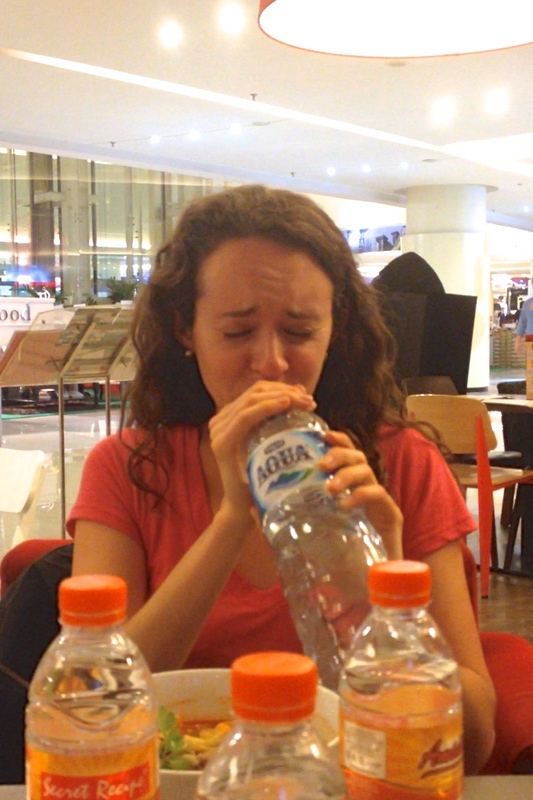 I downed my giant 1.5 liter water bottle in about 60 seconds, eyes watering and mouth on fire while my friends laughed and filmed it. Looking back on it, it really was pretty funny! After that, it took maybe 30 minutes for the burning to go away. Crazy, right? Since we were at the mall when the pepper incident occurred and the mall happened to have a Coldstone Creamery, ice cream was very necessary afterwards. The cheese ended up being fine, but after I took a couple bites, I realized that there were kidney beans and chopped pieces of hard-boiled egg mixed into the sauce below the top layer of pasta. 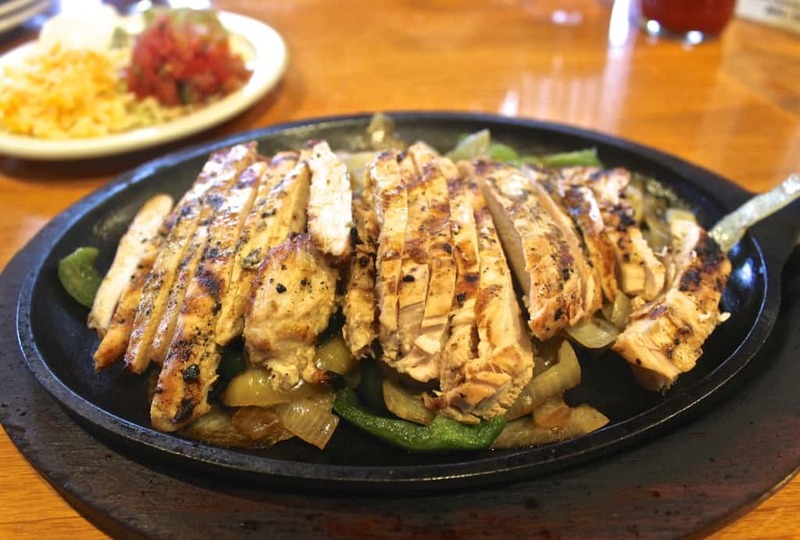 Hmmm…interesting..
We went to Chili’s one day for lunch and I ordered the chicken fajitas, which tasted just like they do in the states. I’ve been surprised by how many chains (Burger King, KFC, McDonalds, Carl’s Jr, Chilis, Coldstone, Baskin Robbins Gold’s Gym, etc.) are here in the Jakarta malls! We also went to a restaurant with safe raw produce one night and I ordered the make-your-own family-size salad for my entree. It came in a mixing bowl and I demolished the entire thing, no problem. It’s amazing how good salads taste after not having them for a while. Those were just a few of the meals we’ve had so far (for the most part, the more delicious ones). Eating out is a bit different here since we basically just point at what we want on the menu and it’s hard to ask for healthy restaurant substitutions like I normally would, such as “no butter, please” or brown rice instead of white (they actually don’t even have brown rice here). I’ve had melon every day at breakfast and we’ll usually stop by the grocery store to pick up water bottles so I’ll grab some bananas, but that’s pretty much the extent of the produce I’ve been able to eat (although there are cooked veggies sometimes…usually they’re just coated in lots of oil). 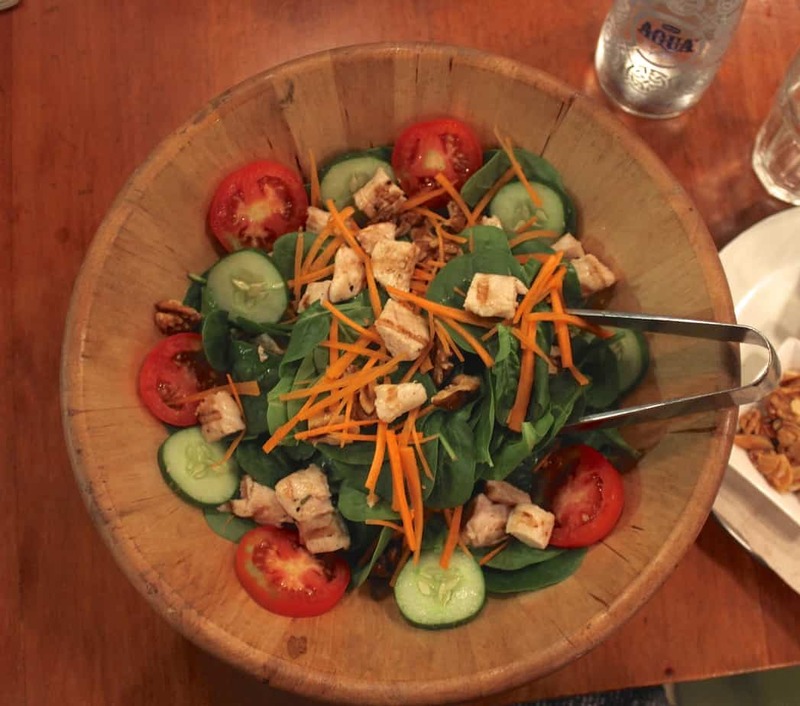 A giant grilled chicken salad with lots of fruits and veggies on top will taste heavenly when I get home! I’ll fly back on Sunday and hopefully be able to check in again on Monday! And don’t forget that today (Thursday) is the last day to enter my KIND bar giveaway– it’ll close at 11:59 pm EST. What’s the strangest food you’ve tried? Octopus- it was purple and chewy. Coldstone, Ben & Jerry’s, Haagen Dazs, Dairy Queen, or other? Probably Ben & Jerry’s or Coldstone for me. It depends on what it’s in, but I usually do. I used to love Almond Joys! I’m so picky, I think I would have major issues eating in Indonesia! The juice sounds really good though! Favorite ice cream is Coldstone and Ben & Jerrys in a close second! Haha let’s go with that! It sounds about right 🙂 And kind of makes sense…bell peppers are big and not spicy at all but this tiny pepper was killer. I tried yellow watermelon last year and liked it. That coconut water…I’m jealous. So, to answer your question, yes I like coconut. 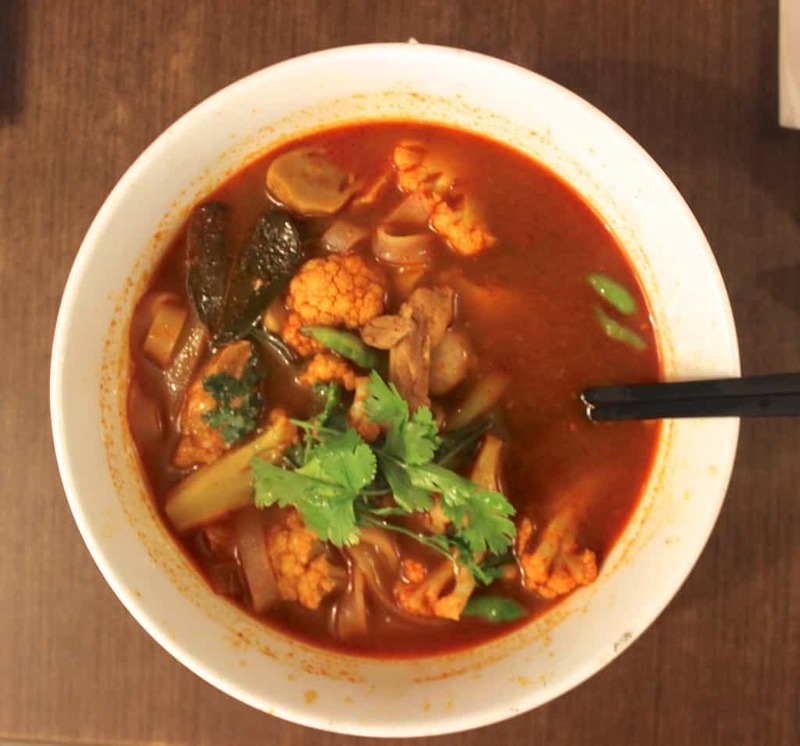 Thanks for sharing these pictures, it’s cool to see what people eat in different countries. So crazy about the pepper! I love trying new foods, so your trip looks pretty excellent to me. And satay sounds really lovely. Ooh I’ve heard Jeni’s is amazing! I’ve had Graeter’s and I LOVED it. The chocolate chips are like chocolate boulders! You’ve already been there for almost two weeks? Wow this has flown by for me too! I hope you enjoy these last three days and have a very safe trip home. That snake fruit looks SO cool. I have never seen it before, but the name is entirely fitting! The strangest food I have ever tried was probably octopus as well! Definitely too chewy for me. Ugh yes, no more octopus for us. and thanks, Julia! Such unique eats- Indonesian cuisine sounds pretty awesome. So sorry about the chili incident, I would have most likely DIED in that situation as I cannot handle the slightest of spices! 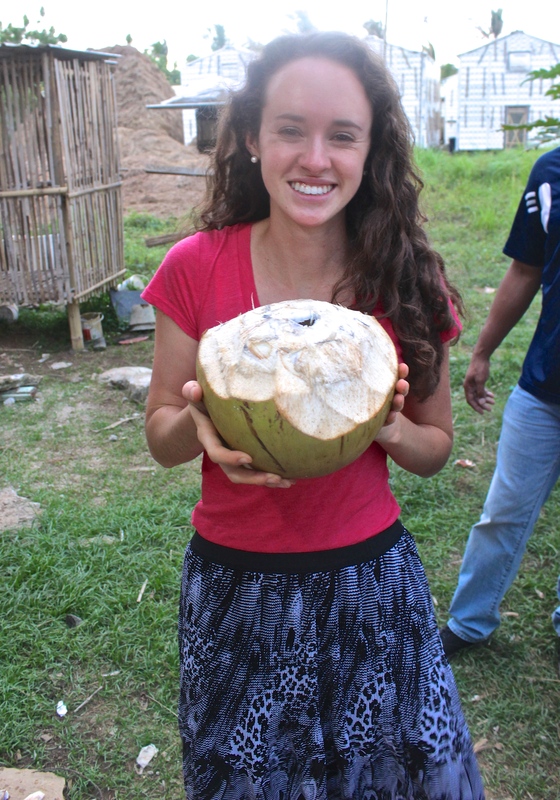 I am a huge coconut water fan, that coconut looked so huge and delicious! So enjoying seeing your pictures! I highly recommend eating the fried rice from the street carts. Dairy Queen was my jam! I wish they were around here 🙁 The weirdest food I’ve ever had is Nori. It was really strange tasting…I don’t buy it often. I’m glad you’re having such a good time! I just had to look up what nori is haha– Japanese seaweed! I’m not sure if I’d like that either, haha. Dairy Queen blizzards are SO good and totally remind me of growing up! Oh. My. Gosh. What you did with the pepper? So much like something I or my sister would have done. I am so sorry! Thanks for the warning! I’ve never had Ben & Jerry’s (want to change that! 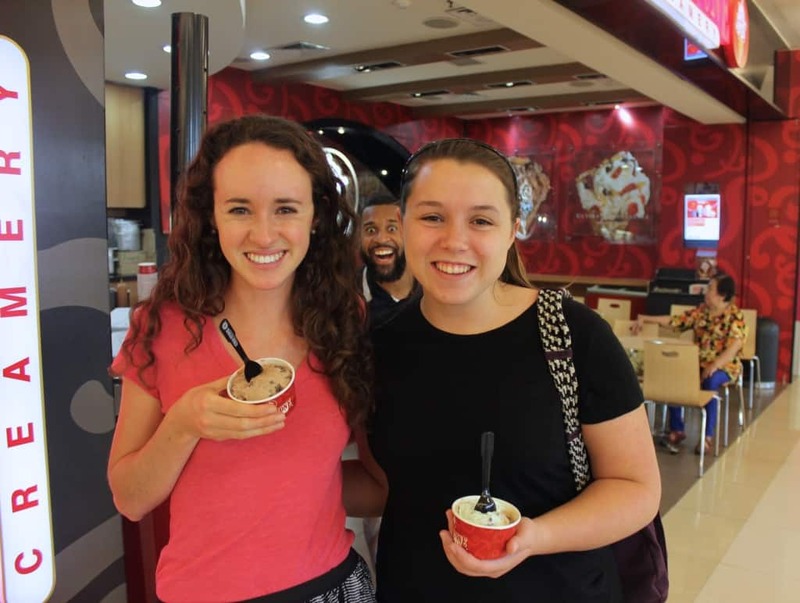 ), only had a bite of Haagen Das, and haven’t had Coldstone for several years, so I don’t know… 🙂 But your Coldstone looked really good! I have been recently disappointed with DQ, and decided it wasn’t worth it. I really like Costco’s vanilla ice cream, even though I’m a chocolate girl all the way. I like that you can add whatever and you have a different flavor of ice cream, and I almost always have it with homemade fudge sauce. I’m sure it doesn’t compare with the nicer brands you are talking about, though! That pasta dish certainly sounds interesting. You can normally always rely on a breakfast buffet to get a decent healthy meal. Oh, and I probably would have enjoyed those chillies, I am obsessed. That chicken noodle soup looks fantastic!! That chicken noodle soup looks fantastic!! 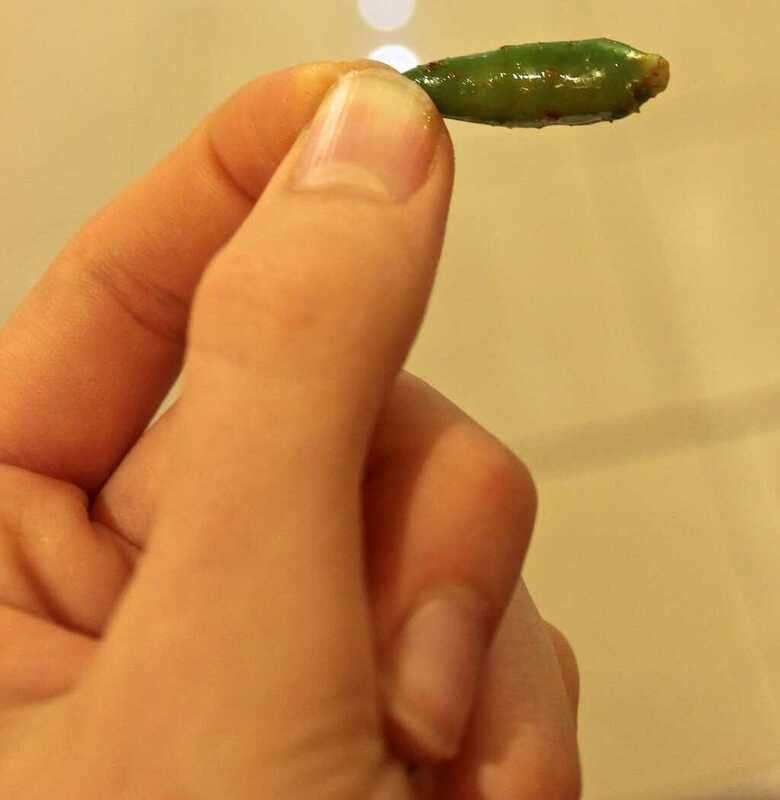 But I am SO sorry you accidentally ate the chili pepper! I can only imagine how terrible that felt in your mouth (and stomach). My mom is a crazy lady and she eats those raw. Wut. No way, how does she eat them raw?! I seriously thought my throat was going to close up for a couple of minutes because the pepper was so spicy! I didn’t know there was such a thing as yellow watermelon! 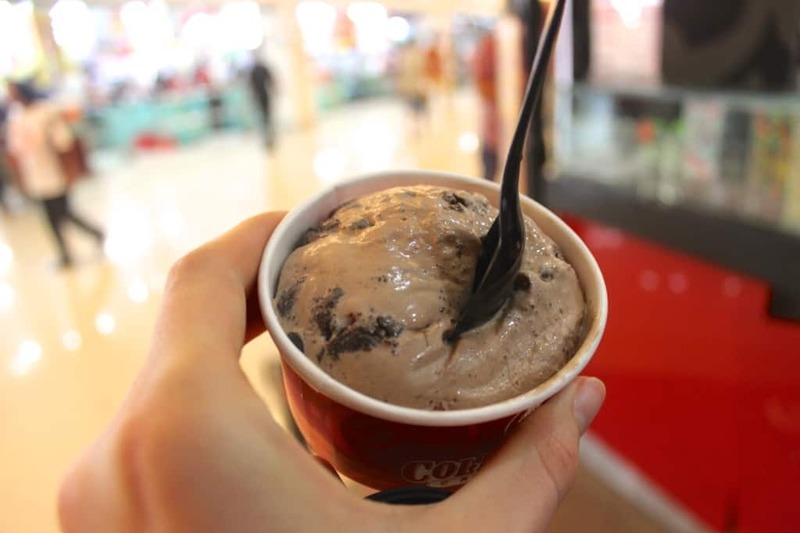 Definitely Cold Stone for me! I haven’t had it in too long, but I always used to get chunks of brownie mixed with the cheesecake ice cream! WOW Indonesia…you must be having so much fun! The dishes look really good. I’d never seen a snake fruit before, I’d love to try that! And yesss I love coconut. Coconut EVERYTHING for me!